Arch Duke Charles, Austrian Warlord (1771 - 1847) It seems like a quirk of history that the two most significant military commanders in such a belligerent age as the end of the 18th and the beginning of the 19th century - the French emperor Napoleon and the Habsburg Arch Duke Charles of Austria - both appear to have suffered from epilepsy. In early infancy, Charles had a weak constitution, which, however, did not prevent him from pursuing a military career with his characteristic persistence and tenacity. 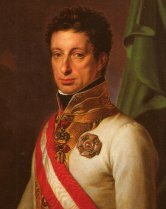 Charles is also described as having epileptic seizures during his active military life, especially in 1785, the year when the Arch Duke was (temporarily) made to resign by his brother Emperor Franz II. Charles's epilepsy served as the pretext for his resignation, but in reality the brothers had argued over military and political matters. Nevertheless, Arch Duke Charles's epilepsy does not appear to have impeded his activities much at all. It was he who inflicted the first military defeat on Napoleon in the battle of Aspern in 1809 and who in 1813 published his intelligently-written three-volume work 'The Basics of Strategy', a "theory of war which is equal that later written by von Clausewitz."